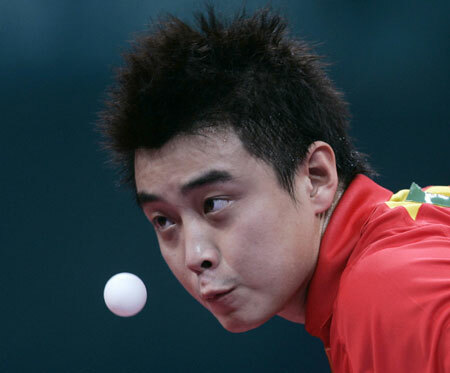 With three titles already secure, Chinese world number four Wang Hao charged over team-mate and world number two Ma Lin, showing little respect for the game of the elder statesman for a powerful 4-1 victory in only 35 minutes. Hong Kong's Li Ching and Ryu Seung Min from South Korea took the bronze. Ma denied that his loss to the 23-year-old Wang signalled a changing of the guard among the ranks of the powerful Chinese paddlers. "It's common for the older players to be challenged by the younger ones. But as long as we don't make too many mistakes I think we can continue to win," the 26-year-old said. China's Guo Yue had a tougher time in the women's singles final, fighting off a ferocious challenge from Hong Kong's Tie Ya Na to finally edge past 4-3. Guo raced to a one set lead before Tie clawed back, winning the second 12-10, only to be overpowered in the third. Hong Kong's world number six again battled back in the fourth to draw level at two sets all. Guo won the next set, dancing around her end of the table and pumping her fists. Smiling in response, Tie took the next set before appearing to fall to pieces in the crucial decider which Guo took 11-2. Guo said she was delighted with her gold, her third for the tournament. "I am really happy because the first two matches I was really nervous and I just needed to slow down and concentrate," the 18-year-old said. Tie, who has a silver medal in the women's doubles, said she never expected to get so far here, and was at a loss to explain the final set. "She (Gue) was probably excellent in that game," she said. China's Ma and Wang Nan earlier teamed for gold in the mixed doubles, also battling through a tough challenge from South Korean youngsters Lee Jung Woo and Lee Eun Hee to win 4-2. Ma said the win would have been come easier if his mind had not wandered. "I lost concentration in the third set which made it a tighter match." China's reputation as kings of table tennis had appeared under threat on Wednesday when Hong Kong won the men's doubles and dispensed with another pair on their way to the finals. Tie had also downed three-time world champion Wang Nan in her semi-final in a upset that surprised both players. But China surged ahead on Thursday, taking their tally to six out of a possible seven. At the start of the tournament, China easily took the team titles, blanking Singapore in the women's final and South Korea in the men's. They then won the women's doubles on Wednesday with Guo teaming with Li Xiaoxia to down Hong Kong. They have easily surpassed their three gold won at the last Games in Busan. Only Hong Kong's Ko Lai Chak and Li Ching prevented a Chinese clean-sweep when they downed Ma and Chen Qi in a reverse result of the Athens Olympics final. Ma revealed deep disappointment at that loss, saying on Thursday that he was pleased to at least come back and take the mixed doubles title. "It was a difficult match for both of us because I lost in the doubles yesterday and Wang Nan lost two matches yesterday. But we played well today and we are really happy that we won," he said.